LIQUID PROBLEM: About 100 litres of water pours out every minute from under George Ene’s house. A HOON HAY man has to put up with more than 100,000 litres of water pouring out from under his house every day. Thirty-seven springs were created around Christchurch by the earthquake, and George Ene had the misfortune for one of them to pop up under his house in Samuel St. 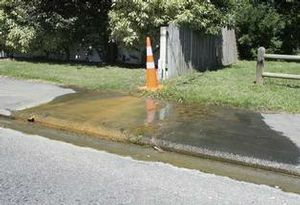 The city council says there was “potential” for damage to Christchurch’s aquifers because of the quake or the after shocks, but no obvious water quality issues had arisen so far. About 100 litres pours out every minute from under Mr Ene’s house – 144,000 litres a day. It’s pumped through a hose to the street, and discharges into the Heathcote River via the stormwater drains. City council water and waste manager Mark Christison said about two-thirds of the 37 springs had popped up in gardens. A few had appeared in sealed roads. Mr Ene, who bought his house just over a year ago, got in touch with the Earthquake Commission after the quake, and after two months was told the spring was a pre-existing issue. He does not know what will happen to sort it out. The spring may be fixable, or the house may have to be demolished for the spring to be controlled. It was not possible to dig under the house, or the house might fall into the hole, he said. Mr Christison said the council had asked Mr Ene to divert the water into his on-site stormwater drain. The council had checked the leak to determine if it was a water supply leak. It was confirmed it wasn’t, and that it was created as a result of the seismic events. The source of the water was unconfined groundwater and did not form part of the city’s water supply system – in other words, it was water hanging around beneath the surface but above the first aquiclude (impervious confining layer), he said. Mr Christison said it was difficult to state if all the new springs were from unconfined groundwater or whether some were from the water supply system aquifers. The Star asked Mr Christison if there was any threat to the city’s aquifers because of the quake or the after shocks. The council was also working with ECan to review private wells across Christchurch, he said. All the water from the springs was channelled to stormwater, he said.